Even the sole proprietor of a mom-and-pop needs to understand these numbers as a readout on the business’s financial health to make key day-to-day decisions such as whether to increase prices, how much inventory to purchase, or whether to hire an employee. While your bank statements might be a yardstick for whether you are in the red or turning a profit, they don’t provide in-depth metrics such as how long your business could survive on cash alone, known as burn rate, or how quickly sales turn into cash, known as the cash conversion cycle. Balance sheet — shows what you own versus what you owe. Income statement — indicates profit or loss over time. Statement of cash flow — combines the income statement and balance sheet to show overall cash activities over time. 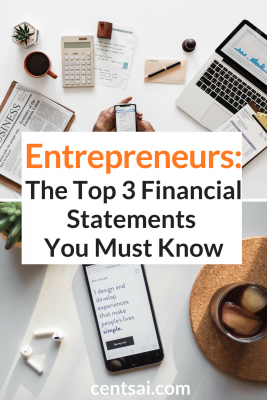 These three statements interrelate, meaning you’ll find items from your balance sheet in your cash flow statement and income statement and vice versa. The balance sheet shows the value of the assets your company has accumulated, the money you owe lenders and other creditors and any other initial investments plus equity built up over time. The balance sheet must “balance” — money you borrow is considered both an asset and a liability and appears on both sides of the equation. For example, if you take out a five-year, $4,000 loan from a bank, your assets (cash in this case) will increase by $4,000 as will your liabilities (such as a loan), thereby balancing both sides of the equation. More simply, think of the balance sheet in personal terms. You have one, as does everyone else. Your personal balance sheet would be how much you owe on the mortgage for your home, your cash in the bank, and interest accrued on your student loans and credit card bills. It’s the same idea for your business. Cash is money you have on hand, while accounts receivable is money you are entitled to receive for your product or service. Pay attention to this number — if, for example, you’re paid on a 60-day lag, your accounts receivable will be high relative to your cash. Or perhaps you have clients who default on payments, in which case you should consider charging a retainer, particularly to first-timers. Inventory (an asset) is relevant to you if you sell a product and prepaid expenses (also an asset) include prepayments for expenses such as rent and marketing. On the other side of the equation, liabilities are what you owe. The most common items for my small-business clients are lines of credit and accounts payable. These are amounts owed to vendors and suppliers. Finally, your equity is your net worth: the difference between what you owe and what you own. This is why you can tell a lot about a company from its balance sheet. Is its debt higher than its assets? How quickly do sales convert to cash? Cash conversion cycle — how quickly you can convert sales into cash. This is very important for businesses that accept prepayments or do not trade in cash, such as e-commerce. Sales and inventory ratios — for companies that hold inventory, how quickly your inventory converts into sales and into cash. Your income statement tells you at a glance whether you made a profit or a loss by comparing what you spend with what you earn in revenue. It itemizes sales, cost of goods sold (costs directly related to your sales) and operating expenses. The income statement records two sets of transactions: operating revenues and expenses (directly related to business operations); and nonoperating revenues and expenses (what you charge or owe that isn’t related to operations, such as taxes). You can tailor the income statement to suit your needs — be it month to month or year to year — and apply various filters to better home in on where your profits and expenses originate. Using accounting systems software like NetSuite or QuickBooks makes this very easy. Say you have two revenue streams — one for selling hair products and one for cosmetics. A lot of small-business owners separate the two, and the cost directly associated with each. They can then analyze the source of their revenue and profits. Entrepreneurs often neglect the statement of cash flow and focus primarily on the income statement and balance sheet. Cash flow is highly useful as a way to map how cash and cash equivalents enter and leave the business. It merges the income statement and balance sheet to show your company’s true net cash flows rather than the transactions it has made, which are shown in the income statement. Sources of cash — investors and lenders will want to know how much money you make from selling your product, selling stocks, fundraising or getting loans. Positive or negative cash flow — negative cash flow immediately signals to investors to back away, stat. Remember, investors and lenders will look for more than just revenue. They’ll want to know that in the event of a loss, you have a cash cushion just in case. So How Do Entrepreneurs Know When to Use Which Financial Statement? When applying for a loan, lenders will ask to see your income statement and balance sheet. Investors, on the other hand, may ask for a statement of cash flow. As a small-business owner, you’ll need to understand all three to make informed decisions for the short- and long-term survival of your company. This article was originally published on Centsai.com. Click here to read the original piece.